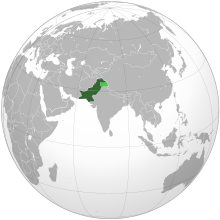 Pakistan is a federal parliamentary republic in South Asia on crossroads of Central Asia and Western Asia. Economists estimate that Pakistan has been part of the wealthiest region of the world throughout the first millennium CE having the largest economy by GDP. This advantage was lost in the 18th century as other regions edged forward such as China and Western Europe. Pakistan is considered as a developing country and is one of the Next Eleven, the eleven countries that, along with the BRICs, have a high potential to become the world's largest economies in the 21st century. However, after decades of social instability, as of 2013[update], serious deficiencies in macromanagement and unbalanced macroeconomics in basic services such as train transportation and electrical energy generation had developed. The economy is considered to be semi-industrialized, with centres of growth along the Indus River. The diversified economies of Karachi and Punjab's urban centres coexist with less developed areas in other parts of the country particularly in Balochistan. According to the Economic complexity index, Pakistan is the 67th largest export economy in the world and the 106th most complex economy. During the fiscal year 2015–16, Pakistan's exports stood at US$20.81 billion and imports at US$44.76 billion, resulting in a negative trade balance of US$23.96 billion. For further information on the types of business entities in this country and their abbreviations, see "Business entities in Pakistan". Sui Northern Gas Pipelines Limited Utilities Gas distribution Lahore 1963 Pipeline transportation of natural gas northern regions. Sui Southern Gas Company Utilities Gas distribution Karachi 1954 Pipeline transportation of natural gas southern regions. ^ Maddison, Angus (2006). The World Economy. A Millennial Perspective (Vol. 1). Historical Statistics (Vol. 2). OECD. pp. 241, &nbsp, 261. ISBN 92-64-02261-9. ^ Faryal Leghari (3 January 2007). "GCC investments in Pakistan and future trends". Gulf Research Center. Retrieved 12 February 2008. ^ a b "World Bank Document" (PDF). 2008. p. 14. Retrieved 2 January 2010. ^ "Pakistan". atlas.media.mit.edu. Retrieved 4 March 2017. ^ Hamza, Abrar (July 16, 2016). "Pakistan's trade deficit widens to 35-year high in FY16". Daily Times (Pakistan). Retrieved 14 February 2017. ^ "Agha Steel Pvt ltd: Private Company Information". Bloomberg. Retrieved 2018-01-30. ^ "Aisha Steel Mills Limited: Private Company Information". Bloomberg. Retrieved 2017-12-16. ^ "Arif Habib Group: Private Company Information". Bloomberg. Retrieved 2018-01-30. ^ "Associated Group: Private Company Information". Bloomberg. Retrieved 2017-12-16. ^ "Atlas Group: Private Company Information". Bloomberg. Retrieved 2017-12-16. ^ "BahriaTown (Pvt.) Limited: Private Company Information". Bloomberg. Retrieved 2017-12-16. ^ "Byco Petroleum Pakistan Limited: Private Company Information". Bloomberg. Retrieved 2017-12-16. ^ "Engro Foods Limited: Private Company Information". Bloomberg. Retrieved 2017-12-16. ^ "Gujranwala Electric Supply Company Limited: Private Company Information". Bloomberg. 2017-01-27. Retrieved 2017-12-16. ^ "House of Habib (Private) Limited: Private Company Information". Bloomberg. Retrieved 2017-12-16. ^ "The Hub Power Company Limited: Private Company Information". Bloomberg. Retrieved 2017-12-16. ^ "History". LESCO. 1998-03-22. Retrieved 2017-12-16. ^ "Loads Limited: Private Company Information". Bloomberg. Retrieved 2018-01-30. ^ "History". MEPCO. 1998-05-14. Retrieved 2017-12-16. ^ "Pak Arab Refinery Limited: Private Company Information". Bloomberg. Retrieved 2017-12-16. ^ "Pakistan Industrial Credit & Investment Corporation Limited: Private Company Information". Bloomberg. 2007-12-31. Retrieved 2017-12-16. ^ "About Us". Qesco.com.pk. 2017-11-30. Retrieved 2017-12-16. ^ "Sharif Group: Private Company Information". Bloomberg. Retrieved 2017-12-16. ^ "Sindh Engro Coal Mining Company Limited: Private Company Information". Bloomberg. Retrieved 2017-12-16. ^ "Tuwairqi Steel Mills Limited: Private Company Information". Bloomberg. Retrieved 2017-12-16. This page was last edited on 22 March 2019, at 03:17 (UTC).